Coldplay frontman Chris Martin began the performance on the field before joining fellow Coldplay members Jonny Buckland, Guy Berryman and Will Champion on the center stage for the band's hit "Viva la Vida" before moving on to "Paradise." 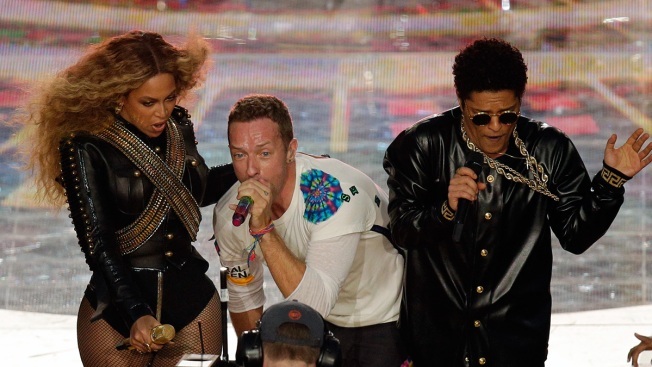 Coldplay singer Chris Martin performs with Beyoncé and Bruno Mars during halftime of the NFL Super Bowl 50 football game Sunday, Feb. 7, 2016, in Santa Clara, Calif. 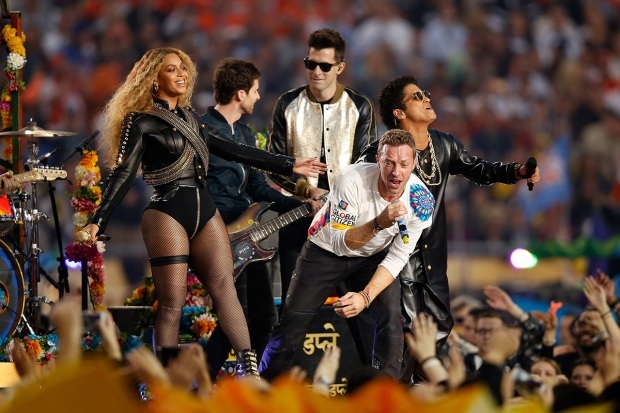 Billed as a musical celebration of past, present and future, Coldplay frontman Chris Martin delivered a high-powered Pepsi Super Bowl Halftime Show with help from Beyonce and Bruno Mars. Martin began the performance on the field before joining fellow Coldplay members Jonny Buckland, Guy Berryman and Will Champion on the center stage for the band's hit "Viva la Vida" before moving on to "Paradise." Aided by screams from the hundreds of fans flanking the four satellite stages, Coldplay then moved on to "Adventure of a Lifetime." Bruno Mars, who headlined the 2014 halftime show, donned black leather, shades and gold chains for a rousing, choreographed dance version of his hit "Uptown Funk" with deejay/producer Mark Ronson, who spun alongside Mars and his backup dancers. Also in gladiatorial black and gold, Beyonce stormed the field with her backup dancers for a stomping interpretation of her new song, "Formation," which she released on her website Saturday. Then it was back to a "Uptown Funk" featuring all three headliners ahead of a video montage looking back across the years of the Halftime Show, showcasing performers such as James Brown, Bruce Springsteen, Michael Jackson, Katy Perry and U2. Backed by Martin on piano the band performed a mash-up of hits including snippets of U2's "Beautiful Day" and Prince's "Purple Rain" with Coldplay's "Clocks," "Fix You" and "Up&Up." All headliners gathered with dancers and fans on stage to take their bow, arms around each other as the crowd went wild in appreciation. At a press conference Thursday, the British rock band said that they will have the Youth Orchestra of Los Angeles there to represent the future and Beyonce — who delivered blazing Super Bowl Halftime performance in 2013 featuring a mini Destiny's Child reunion — for the past. "She's one of our all-time favorites and she's one of the greatest performers I've ever witnessed," Martin said. "We’ve watched all of the other halftime shows many times and most of them are fantastic," Martin added. "I think we’re going to try to celebrate those other years and hopefully make a show as memorable as some of our favorites." Asked if his children with ex-wife Gwyneth Paltrow, Apple and Moses, would watch the band's performance Sunday, Martin said: "I hope they'll watch. What else is on that day?" Just after the game commenced Paltrow posted to Instagram a picture of her daughter Apple and Blue Ivy, the daughter of Beyonce and Jay Z, holding hands at what looks to be a backstage area at Levi's Stadium. Singer Lady Gaga opened proceedings Sunday with a stirring rendition of the Star-Spangled Banner. Wearing a glittering scarlet pantsuit and accompanied by a solo piano, Gaga delivered an uplifting and moving version of the National Anthem. Her white-blond hair swept high and back from her face, Gaga ending her performance by saying "God bless you, America." The Super Bowl was a warm up for Coldplay. The band announced their first U.S. summer tour dates two weeks ago. Beginning in July at MetLife Stadium near New York City, they will also stop in Chicago, Boston, Philadelphia, Los Angeles, Dallas, and San Francisco.